Investigators say there is a Virginia connection to a Catholic Church child abuse scandal unfolding in Pennsylvania. An indictment shows several Franciscan Friars accused of being child predators worked in the Commonwealth. This indictment says there was a cover-up, which allowed four men to work in various churches in several states. They were in the Commonwealth in the 1970's. Child abuse experts fear there are victims out there who have never come forward. This indictment says dozens of children trusted members of the Franciscan Friars only to be abused, molested and assaulted. The documents say four of them had Virginia ties. They are Brother Stephen Baker, Friar Cletus Adams, Friar Martin Brady and Brother Christian Neetz. It says Brother Baker worked at St Bede's in Wlliamsburg between June 1972 to August 1973, St Thomas More in Lynchburg from August 1972 to October 1973, Holy Trinity Church in Norfolk from October 1973 to June 1974 and stayed at the James Barry Robinson Home for Boys in Norfolk from October 1973 to June 1974. Baker is accused of abusing more than a hundred children just in Pennsylvania. Friar Adams was at James Barry Robinson Home for Boys from 1968 to 1970 and at St. Mary's Church in Alexandria in 1969. Friar Brady was also at James Barry Robinson High School from 1968 to 1972. Friar Brady is accused of abusing two brothers in Virginia. Brother Neetz was at the high school in Norfolk from August 1968 to June 1970 and at St. Thomas More in Lynchburg in 1972. The indictment says it's unknown when he left. Saint Bede's, Saint Thomas and Holy Trinity in Norfolk answer to the Catholic Diocese of Richmond. They may have also visited Saint Nicholas in Virginia Beach and Saint Mary in Alexandria. It is unclear how many other Virginia victims are out there. "The bishop there in Richmond should definitely reach out to any potential victims who might still be suffering in silence and shame in that area," said Judy Jones with SNAP, the Survivors Network of those Abused by Priests. All four men are now dead, but they were named in the indictment because their superiors in the Franciscan order, who are still alive, are now facing criminal charges in Pennsylvania. They are Giles A. Schinelli, Robert J. D'Aversa and Anthony M. Criscitelli. They're accused of covering up the crimes for years and giving the men access to children. Now child abuse advocates say victims need to come forward. "It wasn't their fault," said Jones. "It's very healing if they're able to speak about it and even go to law enforcement and report it no matter how long ago it happened." A grand jury report released yesterday in Pennsylvania indicted three members of the Pennsylvania-based Franciscan Friars, Third Order Regulars of the Province of the Immaculate Conception, on charges of mishandling its members who were accused of allegations of sexual abuse dating back to the 1960s. The indictment report includes the names of four Franciscan members - who have since been accused of abuse - who were assigned to positions within the Diocese of Richmond between 1968 and 1972. These four accused Franciscans – all since deceased - were assigned by their order to work at the James-Barry Robinson High School, at the time an independent Catholic boy's school in Norfolk. According to the indictment report, some of these members also assisted at parishes on an as-needed basis within the Diocese of Richmond: at St. Nicholas, Virginia Beach, St. Bede, Williamsburg, and St. Mary, Alexandria. 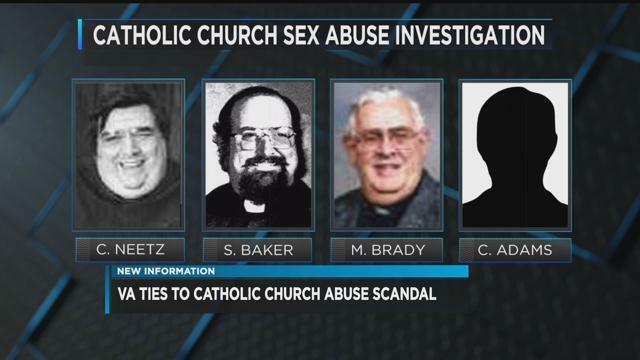 These priests and friars were not assigned by the Diocese to these parishes. As of this date, abuse accusations occurring within the Diocese of Richmond have been reported against one of these members, Rev. Martin Brady, who was headmaster of the independent school, and also occasionally celebrated Mass at St. Nicholas Parish in Virginia Beach. Fr. Brady died in 2003. In learning of the grand jury's action, Bishop Francis DiLorenzo said, "I again express my profound sorrow and apologies for the abuse of innocent children that occurred at the hands of priests and religious. I pledge the Diocese will continue the safe environment training and reporting efforts we launched more than a decade ago to ensure the protection of children. "I also strongly urge anyone who has been abused to come forward and report this abuse to the police and to the Diocese. Our Diocese will continue to cooperate with authorities," Bishop DiLorenzo said. The Diocese has a 24-hour victim's hotline at 1-877-887-9603. Victims may also contact the Bishop's office. Learn more at www.richmonddiocese.org. The indictment also lodged abuse claims against Brother Stephen P. Baker, who resided at James-Barry Robinson High School and assisted at St. Bede in Williamsburg, and Holy Trinity in Norfolk between 1972 to 1974 and committed suicide in 2013; Brother Christian Neetz, who worked at James-Barry Robinson High School between 1968 to 1970 and died in 2002; Rev. Cletus A. Adams, who worked at James-Barry Robinson High School between 1968 to 1970 and celebrated Mass as needed at St. Mary, Alexandria, and died in 1996. Since 2002, when widespread abuse within the Church was first revealed, the Catholic Church in the United States, and within the Diocese of Richmond, has worked diligently to implement the Charter for the Protection of Children and Young People. The Diocese implemented the Safe Environment Regulations, which provide a procedure and structure to address allegations of sexual abuse of minors. These regulations also include a child protection program to include safe environment training (VIRTUS) and background screening for all diocesan and visiting clergy, employees and volunteers working with minors. In 11 years, the Diocese has trained and conducted background screenings on more than 40,000 adults and remains in full compliance with the Charter.